As Bernd has stated in his article if there weren’t the low mechanical losses of the Wavecor’s SW118WA02 subwoofer unit, prerequisite for good detail retrieval in the low frequencies, as well as the existence of another Wavecor driver – the dome twitter TW030WA12 – capable of going flat from 1 kHz up to 35 kHz, this project wouldn’t have been possible. The later is required for setting the crossover point well bellow the subwoofer’s intrinsic cone break-up resonances occurring at 2.5 kHz. As Bernd has found out 12 db attenuation per octave (second order filter) starting at around 600 Hz is the optimal condition for this driver to sing. Acoustic and electrical measurements followed and all the collected data has been entered into the software simulation program AJHorn which after some intensive computations concluded that a 7 liter ported enclosure would be enough to allow the woofer to reach its limits – namely 39 Hz at -3db. Though the practice proved AJHorn being on the optimistic side, good 42 Hz at -3db were measured at Timmermanns’ lab in Kleve, Germany. What I like about Hobby HiFi magazine is that every speaker project is thoroughly documented – all the electrical and acoustical measurements of the speaker’s combined response, as well as parameters of the individual drivers, enclosure construction, choice and distribution of damping material, crossover network schematics and tweaks are to be seen along with subjective listening impressions and many more. This allows for getting deeper understanding of the speaker construction and the way all the parameters interact together. Good documentation is one very important factor when deciding upon which recipe to take, but there are other indicators one might consider as well – user’s feedback, listening impressions, costs, availability of enclosure kits, assembling difficulty and so on. It was something in Bernd’s description of their sound that caught my attention and aroused my curiosity the most. The choice of particular adjectives, the alternation of passive and active verb forms, small traces finding their way in the sentence’s syntax were revealing his sincere awe in front of his creation. Human voices for example were possessing kind of shaped substance or plasticity (Stimmen wirken au­ßer­or­dent­lich plastisch und natürlich) that draws them out of the rest – it is about tangible presence of another level that approaches the live event in an unprecedented manner. You have to know dear reader that I am acquainted with Bernd’s way with the words for I’ve read dozens of his articles, and I sort of read between the lines, which means I consider not only what has been written but also what has been omitted and how it relates to his writing style and established patterns of expression. There was even more if I have to be precise – there was a wave of positive feedback by DIY-ers that have built the first Micro Block version after its release in 2015; the price of the kit (450 euro pair) lays well within the range of affordability of the regular person; as a bonus comes a CNC machined enclosure kit available from Ebel Holztechnik in birch plywood or MDF, which is conceived in a way that do not require clamps for putting it together. I was playing also with the idea of trying something completely different than my horns, something based on a modern technology, low efficiency, wide frequency range, and textbook flat response. I have to mention also my fascination by the Do-It-Yourself culture in general. 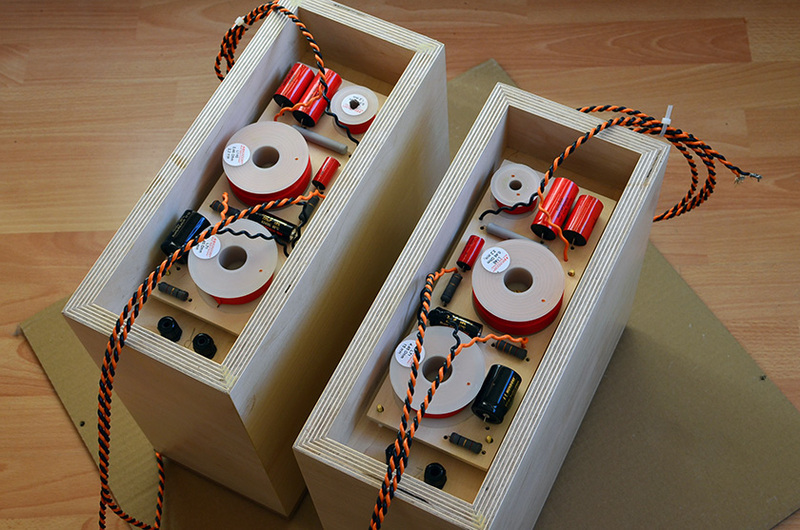 Going through the step-by-step process of assembling a speaker, which takes days and even weeks of voluntary work, rises the excitement and the value of the very moment when the project is finished and the evaluation of its sonic outcome should take place. Putting them on the stands, connecting the cables, preheating the amp, all the expectations and uncertainty, choosing the first piece of music that’s gonna flow through them after all the hard work is so much more exciting compared to the same procedure performed with a commercially available product one acquires by simply departing with particular sum. Even this is enough to justify all the challenges and hazards one have to face during such adventure into the unknown. And then the culmination comes with the first tones filling the space, the initial apprehension of the sound character, which in a flash of a second aligns the complex nature of the acoustic waves in accordance to established paradigms, previous experiences and expectations. The immediate reaction can bring a smile, puzzlement or even grimace to your face. What Micro Block MK2 elicited as a facial expression from me in that very first second was a broad smile and a feeling of great relief and satisfaction. These speakers are wonders was my first thought, and the more I listened the broader the smile, the more amused and bewildered I got about how this was possible. Later on came the realization how grateful I am to their creator – engineer Bernd Timmermanns – and how I wish to express my gratitude and tell him that he has created something beautiful, something that simply invites you to dive into another world, forged by music instruments and human voices weaving abstract ideas in harmony, melody and rhythm. As I already said Micro Block is a two-way construction combining Wavecor’s 4.5″ paper cone subwoofer unit SW118WA02 and 3″ silk dome twitter TW030WA12 in a 7 liter ported enclosure. The extended frequency coverage of the twitter featuring waveguide face plate for controlled dispersion makes it possible for a rather low crossover point at 1.3 kHz which is beneficial in terms of achieving more natural sound and seamless integration of both drivers. Bass reflex channel has 5 cm diameter, total length of 25 cm. and two 90 deg turns. The crossover network is based on 2nd order low pass filter for the woofer and 3rd order high-pass filter for the tweeter. This arrangement brings the crossover point exactly 6 db below the combined response and ensures optimal phase alignment. An additional LCR circuit parallel to the woofer is smoothing the impedance peak caused by the port interaction and flattens the frequency response between 80 and 300 Hz. The enclosure is rather sturdy, made out of 24 mm (front baffle) and 19 mm (the rest) thick plywood and has internal cross-bracing from the same material. Damping material consists of polyester felt in 2 cm thickness. 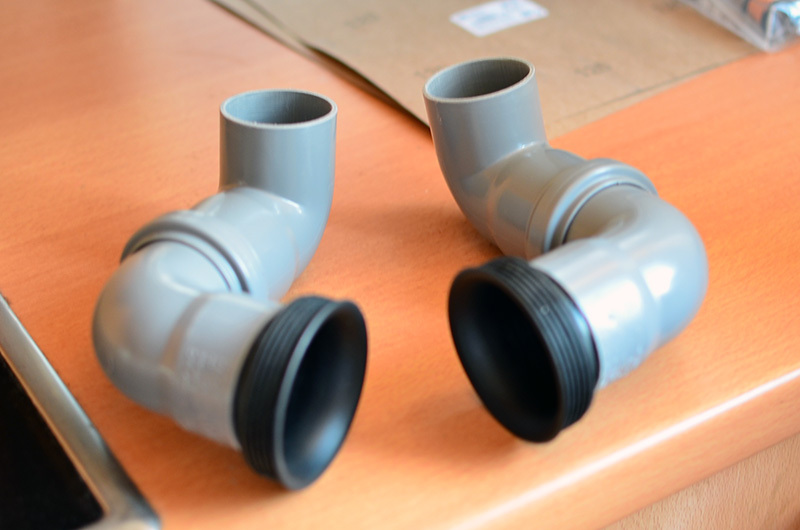 The port is side-mounted, this is a common trait for all bass-reflex constructions developed by Bernd Timmermanns and ensures better acoustic phase alignment compared to the back-firing port while eliminating disturbances in the midrange region that are likely to occur when the port is front-mounted. The crossover is external, accommodated at the back of the enclosure, which ensures resonance free environment for all electrical components. Frequency coverage (-3 db) 42 Hz – 35 kHz, Sensitivity (2.83 V, 1 m) 80 db, Impedance 8 Ohm. Since the initial run and completion of the burn-in period during which the driver’s suspension and the characteristics of the electrical components smoothen two main improvements took place. The most noticeable one came with the implementation of impedance linearization network that is basically a LCR series circuit in parallel to the speaker/amplifier terminals. Usually every speaker project presented on the pages of Hobby HiFi magazine is accompanied by dedicated impedance linearization network that Bernd Timmermanns highly recommends for use with tube amplification. The reason is that tube amplifiers like to see relatively constant impedance load in order to have a good grip on the speakers and perform to its best, which is due to the fact that vacuum tubes are voltage gain devices and need transformers for voltage to current conversion – a sort of complication their transistor counterparts don’t have to deal with. The thing is that most speakers have impedance peak at the crossover point where both drivers work in parallel and the impedance might easily reach several dozens of Ohms. In the case of of Micro Block MK2 the impedance at 1.3 kHz rises to 30 Ohms. By flattening this peak out everything comes to its place, the impression is that the amplifier has multiplied its power and has way better control over the speakers, stage becomes deeper, voices become shape and body, it is simply an amazing improvement by such a little investment. I can’t recommend you more to try such a network in case you are using tube amplification and the speakers you are driving doesn’t have such built in. What you will need is a graph of the impedance load curve across the frequency spectrum and appropriate Zobel network schematics that addresses the impedance peak at crossover point. The next major improvement was brought by Audio Note K speaker stands Peter sent me to try. This is simply amazing story that is hard to believe if you haven’t experienced something similar. 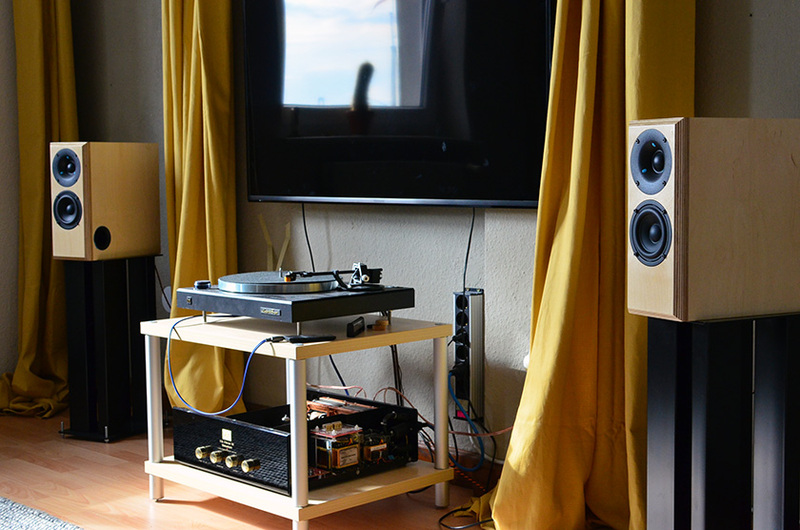 I thought my sand-filled MDF stands were not bad, but once I put these steel stands together and placed the speakers on top of them my jaw dropped – such a sense of weight and energy in the low registers, clarity, separation and plasticity of individual voices I didn’t expect. Peter further recommends putting in some 15-20 kgs of bird shot (used in shot guns) one can normally find in hunting shops. I realized how important the stand’s quality is, it really makes a difference and the investment is well worth. One thing I like about venturing into DIY projects is the possibility to continuously experiment and fine tune different aspects of construction (damping, port, crossover) over longer periods of time and eventually gain additional improvement in performance. The case is that even if he wishes Bernd Timmermanns has limited time that prevents him to go through all the the possible scenarios for he has to deliver 3 speaker projects complete with measurements and documentation every two months, which is the time interval a new Hobby HiFi issue is released. That leaves for the DIY-er the chance to further work on improvements that a project potentially has. Addressing minor issues and refining small details stack up together and might at the end bring the project further ahead. Many speaker builders consider the fine tuning as a never ending process, which I find true to certain extent, though there are limits one could reach above which the degree of improvement is so minor or hard to identify that one could conclude the available potential has been explored. After 3 months of playing with these speakers I would say their performance reached a level that leaves nothing or very little to be wished for. I experimented with different types of damping material and combinations between them. Some were discarded pretty early, other took a considerable time to assess. 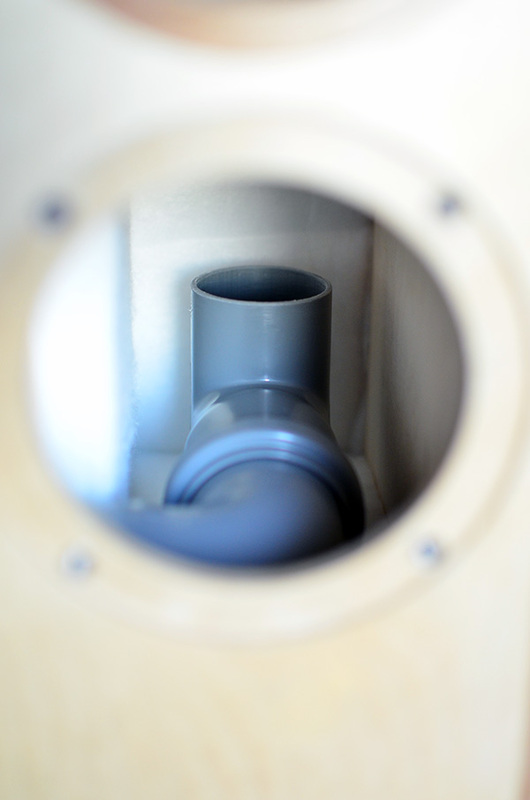 Bernd’s approach to this speaker is to use entirely polyester felt of 2 cm thickness, the so called Bondum 800. With it he covers the top, back, bottom and one of the side walls – the one where the port is mounted. I ended up slightly modifying this arrangement by replacing the piece of polyester felt covering the top wall with 1 cm thick self-adhesive fleece made out of recycled cloth, the so called Dämmvlies 10 PRO-501. Additionally I added a stripe of the same material at the upper part of the uncovered side wall. I found out that in direct proximity to the tweeter this material works better than the polyester felt. 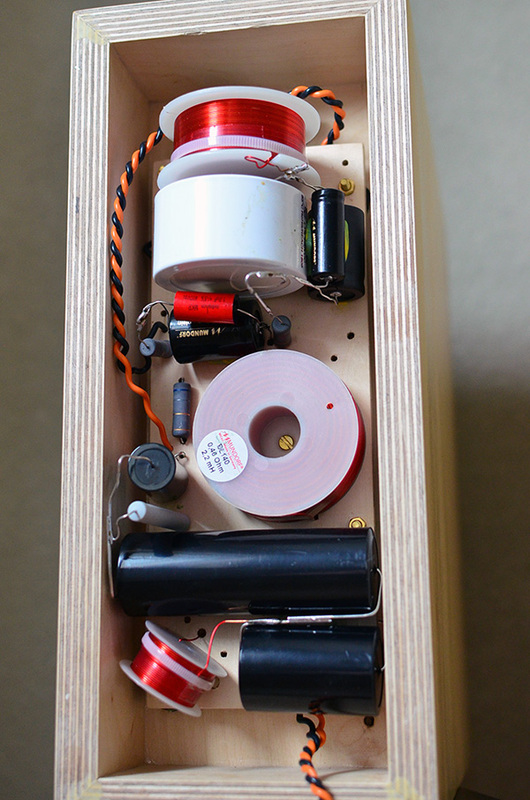 Further on I experimented with the bass-reflex channel which has two 90 deg turns in order to accommodate a total length of 25 cm and 5 cm diameter in the rather compact internal volume of the speaker. After the first 90 deg turn that directs the channel towards the back wall I experimented with different angles and directions of the channel throat, but at the end I was able to confirm that what Bernd has achieved is unsurpassed. So I keep the original configuration with two 90 deg turns and channel throat pointing towards the top wall. The only thing I added is a bell opening of the throat that allowed also for extending of the channel length to 27 cm. The bell opening brought a noticeable improvement in midrange clarity, tauter and more earthly anchored bass. 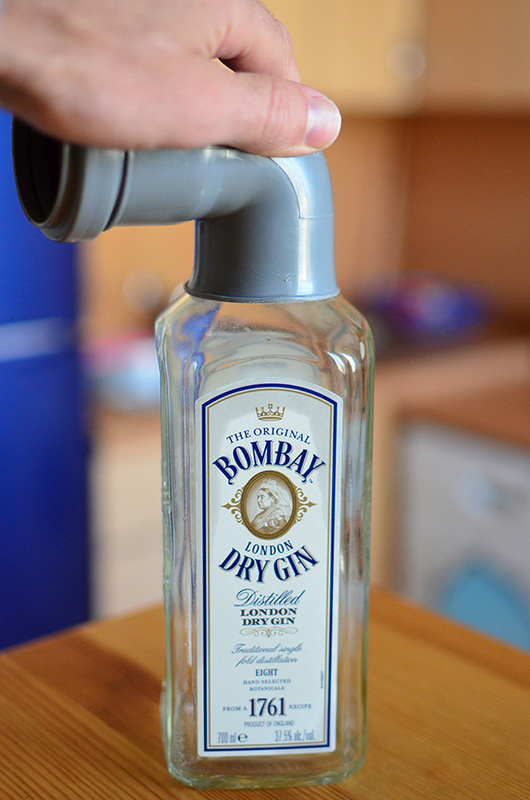 Good old Bombay – the liquid is gone but the bottle still can be used – this is what I call usability. Preheat the knee on the stove and press firmly against the bottle’s neck, now you have a bell flared throat opening. 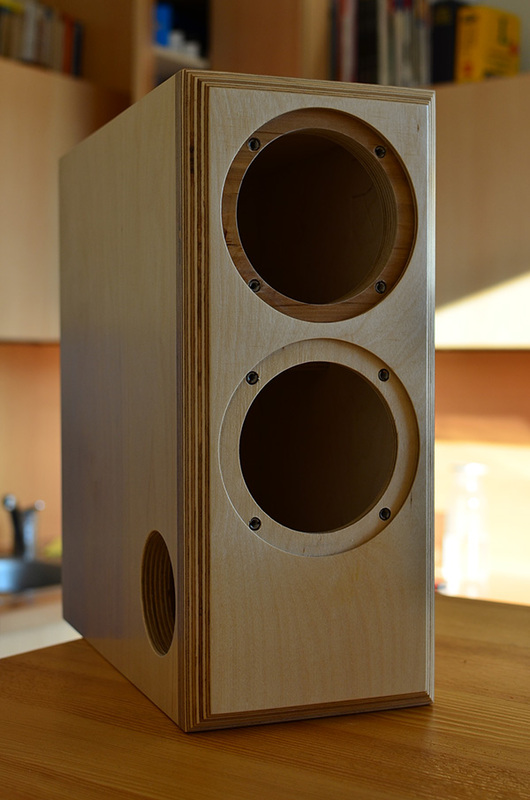 Crossover design is where this second iteration of the speaker is all about. I went through its first version by removing the impedance linearization circuit parallel to the woofer and resorting to a second order filter for the twitter just to get an idea about the progress of this project and it became obvious that MK2 version with its more complex crossover network presents clear improvement. The crossover design is where the strength of Bernd’s expertise and knowledge really shine, and I was able to confirm that any deviations from the recommended values of the elements were only degrading the beautiful balance and integrity this speaker posses. Still, I gained slight improvement in clarity by turning the 15 mH inductor – the one that is part of the Zobel network parallel to the woofer – crosswise thus changing the orientation of its magnet field and increasing the distance to the next inductor. It looks like when placed close together and in the same plain both inductors magnetically couple and sound gets compromised. In conclusion I have to say that these speakers driven by Audio Note Oto SE Signature with dedicated impedance linearization network and AN-K steel stands surpass anything I’ve had pleasure to listen to. Especially the midrange is where the magic happens, human voices stand out of the rest with tangible presence that always brings amusement. Listening to well recorded albums such as Herbie Hancock’s Gershwin’s world (Verve Reissues, 2015) is such an experience I could hardly put into words. Micro Block MK2 are extremely good in conveying human presence as well as expressing realistic dynamic contrast. 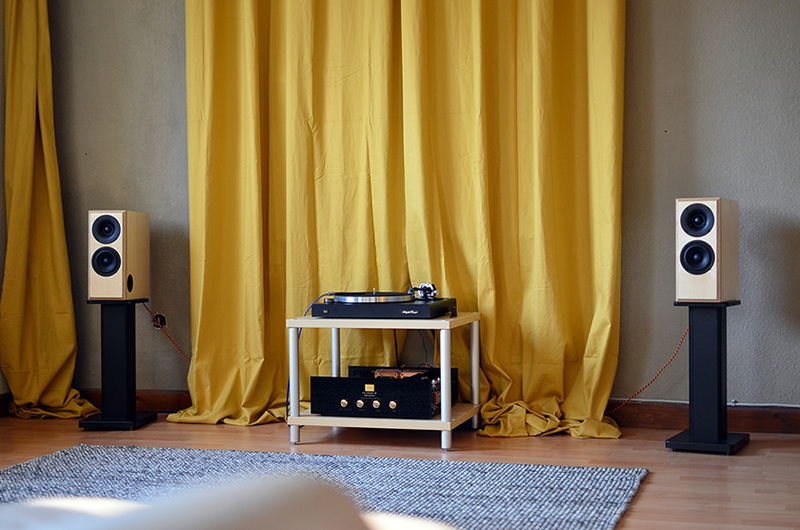 The sound sources have shape and body and an unmistakable sense of gravity that makes music listening so engaging. In comparison to BK108 Micro Block MK2 can’t quite match the low-level detail retrieval of the horns, nor the integrity of the single driver impulse response. Guitar rasgueado is sharper on the single drivers, and one can get better idea of the recording venue through the horns. Dynamic contrast I would say is similar, Micro Block MK2 are very capable in recreating the sudden burst out of loudness and going back into silence. The regions where these two-way speakers excel are the frequency range they cover, the flat response and the lack of obvious colorations, which brings the listening experience closer to the real thing. They sound very clean and precise, approaching the performance of good headphones. While the horns are mainly suitable for acoustic music, with Micro Block MK2 I can enjoy wider variety of records and musical genres. So putting virtues and weaknesses on the scale my preference is on the side of Bernd’s two-way bass-reflex construction. These speakers really rock guys, and I can only recommend them. With great interest I have read your report on the this exciting new project. 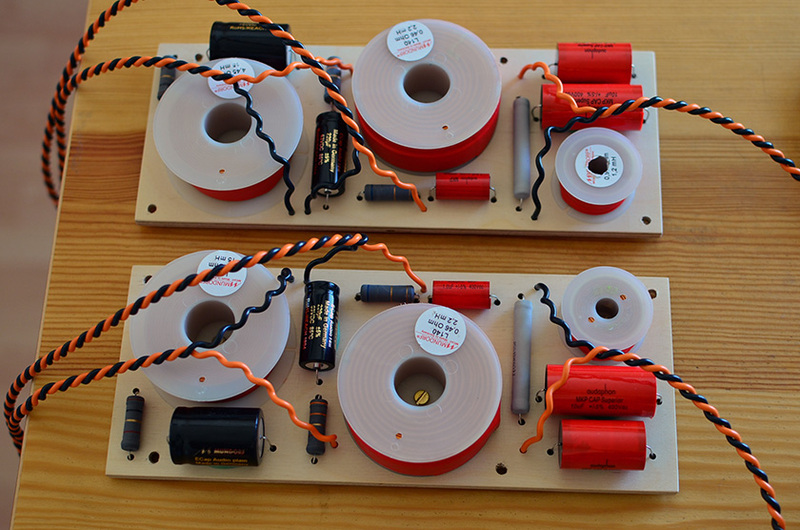 I am about to order this kit for myself and would like to ask if you were able to share the list of parts you used for the crossover including the construction scheme (unfortunately I do not have the Hobby Hifi issue currently available). Here a list of parts is published and was wondering whether if you have used these very parts? However, somewhere in your report Mundorf mCap Supreme capacitors are mentioned, that I am unable to find in this list. 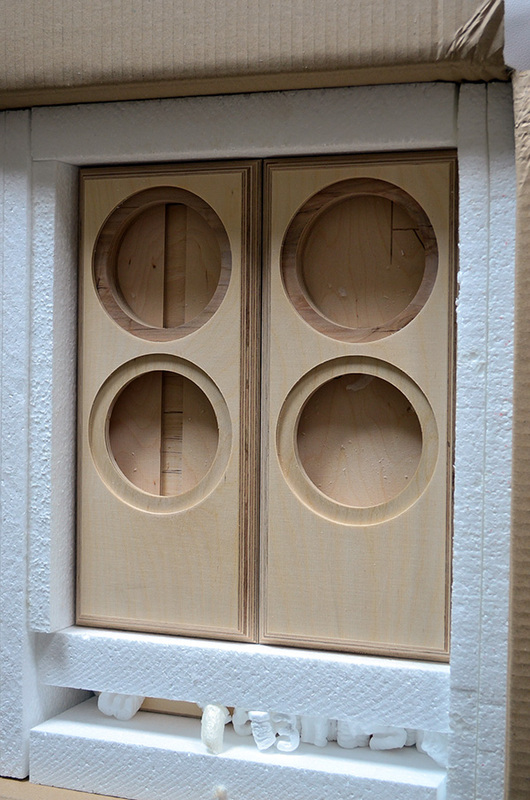 One more question: how difficult was the assembly of the speaker housing provided by Ebel Holztechnik and did you use any clear lacquer respectively for finish? The kit you are referring to is the so called high-end recommendation, I haven’t tried it. I started with the budget version of the crossover and improved it further by replacing parts one by one, which also gave me the possibility to asses the influence of individual parts themselves. If you decide for the budget version of the crossover it is a good idea instead of the regular air core coils to go for the Mundorf baked varnish air core coils that are just slightly more expensive but the improvement in sound is noticeable. If your budget allows, you can also opt for the Mundorf copper foil coil inductor in the low-pass filter, though its price is higher than the price of the woofer itself. The default Audaphon foil capacitors included in the budget version of the crossover are not bad but you can achieve further refinement in sound by replacing them with better ones. Though Mundorf mCap Supreme capacitors are very good match, they are quite bulky and tricky to mount in the limited space at the back, so I would advice you to try something else instead – Jantzen Audio Superior Z-cap, Intertechnik Audin Cap Plus or Mundorf MCap Supreme Evo Oil come to mind. A printed version of the Micro Block MK2 article from Hobby HiFi is included in the kit, I have no right to publish it, but I may ask Bernd if he would allow me. For mounting the speaker drivers on the baffle I use bolts in combination with threaded inserts which allow for easier mount/unmount procedure and avoiding the danger of destroying the fragile screw holes. At the same time threaded inserts are tricky to implement so you might consider Serfix inserts that Bernd himself uses in many of his projects. Assembling the enclosure is a breeze, it is a CNC machined one so tolerances are kept to minimum, you need a wide enough scotch tape and a brush for distributing the glue evenly. I used a clear spray lacquer, but a regular one or varnish might do as well, it is a matter of preference.